River Tamar. | Launceston Then! 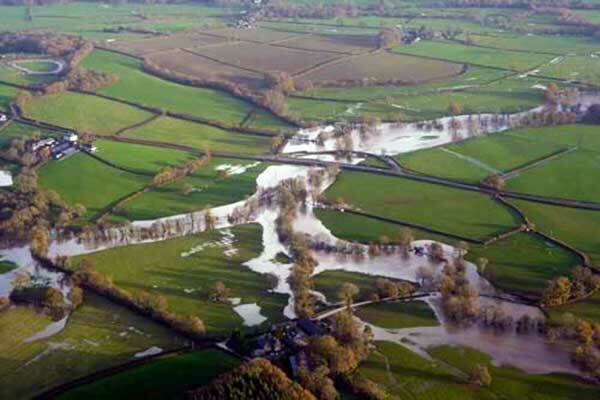 The Tamar and Ottery break their banks at Ham Mill in 2010. The Tamar’s (Cornish: Dowr Tamar) source is less than 6 km (3.7 mi) from the north Cornish coast, but it flows southward and its course runs across the peninsula to the south coast. The total length of the river is 61 miles (98 km). At its mouth, the Tamar flows into the Hamoaze before entering Plymouth Sound. 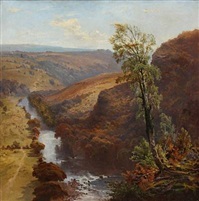 Although the Tamar’s source is only a few miles from the north Cornwall coast, the river doesn’t reach a town until it passes to the east of Launceston. 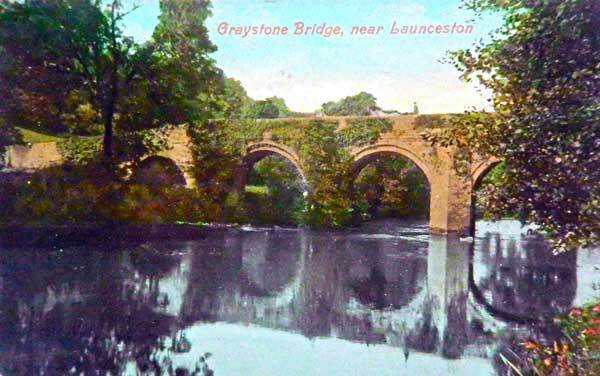 The river reaches the Launceston area below Tamerton where the valley begins to deepen, it passes under Boyton towards Tamartown where there is a ford. It then reaches Bridgetown. Just after this the tributary Tala Water from Bullapit joins. For many centuries this is where the Tamar lost its control of the County boundary gaining its control when the Attery joins it at Ham Mill near Werrington. The boundary was changed in the mid 1960’s so that the Tamar today forms the natural divide for its entire length. The River Cary now feeds into the river as it continues its advance through the valley which now opens out by Netherbridge and towards Polson. It is just before this bridge at St. Leonards that the River Kensey feeds into the Tamar. The river then receives the tributary waters from Dartmoor of the River Lyd, and then enters a narrow pass with steep hills on either side at Greystone (Greyston). It is here that the Lowley Brook (Loueleghe) enters the Tamar. The river now takes on its graceful meanderings through the woods of Endsleigh (Inney’s Leigh). Here can be seen some of the most breathtaking views of the river, where, at Carthamartha (below right), the bustling Inney adds its water’s to the now maturing Tamar. It is at this point that the Tamar leaves the district as it heads towards the grounds of Endsleigh and its ultimate goal of Plymouth Sound. The legend behind the name involves a nymph by the name of Tamara, who lived in the underworld. Tamara wanted to wander freely in the mortal world, against the advice of her parents. One day, wandering in Dartmoor, she happened to meet two giants called Tavy and Torridge (or Tawradge). Both giants became smitten with Tamara and vied for her affections. Tamara led the giants on a dance, but never let them touch her, instead darting out of reach whenever they came too close. Tamara’s father, who had been out looking for her, located her just as the giants finally caught up with her near Morwenstow. He flew into a rage and used a spell to put Tavy and Tawradge into a deep sleep. This infuriated Tamara, who subsequently refused to return to the underworld with her father. He became even more enraged and cast a spell on Tamara, turning her into a bubbling spring, which produced the Tamar river and flowed all the way to the sea. Tawradge awoke to find his beloved had become a river; in despair, he sought the advice of a magician, who turned him into a river (the River Torridge and the River Taw) so that he could hope to reunite with Tamara. Tawradge was never able to find and merge with his beloved Tamara, instead turning north toward Bideford and the Bristol Channel and is still said to mourn his love, the Tamar. This legend explains why the River Torridge, which rises only 500 meters from the Tamar, veers away from the Tamar and forms a huge arc, eventually flowing to the North Devon coast. The other giant, Tavy, also awoke in despair and sought the aid of his own father, also a powerful magician. His father turned Tavy into a river as well, and the Tavy set off in search of the Tamar, eventually finding her and merging with her into a wide and beautiful estuary.